One step closer to the dream? According to a new report, Village Roadshow co-CEO Graham Burke has confirmed that Netflix is currently in negotiations with the production and distribution company for a possible Australian launch. Speaking to ZDNet about the US-based streaming service that has most Aussies envious, Burke said: "... they're talking to our people about supply of products, so they are opening and coming to Australia." He didn't give a time-frame for an Aussie launch, but as Netflix has had its logo trademark registered in Australia since October 2012, the confirmed negotiations hints at a launch that could happen as early as next year. Netflix is currently available in the US, Canada, Mexico, parts of South America, the Caribbean, the UK and parts of Europe. Accessing international shows and documentaries easily and fast in Australia has been a bit of a sore point for Aussies, though local services like Foxtel Presto, Ezyflix and Quickflix have popped up over the past few years. 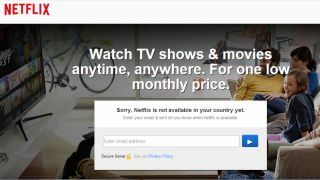 While talks of piracy legislation and site-blocking are headlining at the moment, if Netflix does launch in Australia, people will no longer be able to use the lack of cheaper Netflix-like services being available as an excuse for piracy of shows and films. Netflix will still need to negotiate deals with international production houses and distribution companies - as it is with Village Roadshow - as well as with Australian companies that hold distribution and broadcasting rights in order to be able offer shows, films and docos as part of its own Australian library. The deals it does end up making could determine how attractive the service is in Australia, as we may end up with a bare bones library due to exclusive rights other services have. So until a launch actually comes around to Australia - and while regulators, governments, distributors, and ISPs argue the legality bypassing geo-blocks - Aussies will likely continue to resort to VPNs to gain access to the cheap and quick Netflix.